A candidate for a history PhD got S24, W27 (total 107)! My student “CL” is quite a shy guy, so he didn’t want me to put his picture or his name. 🙂 However, he is super smart and he is very inspirational so I wanted to share his story. 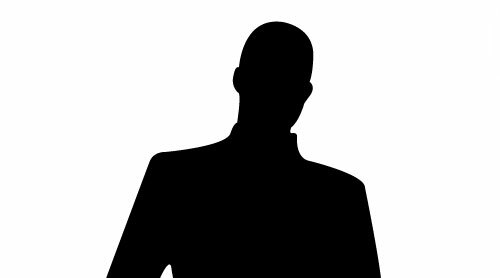 Before he worked with us, his speaking scores at TOEFL were 18 and 19, and his writing was 20 both times. His reading and listening scores were already strong (R 29, 27 and L27, 28). He wanted to maximize his speaking and writing scores. CL started his TOEFL lessons with lots of time, so we were able to do a lot of practice. L was very committed to increasing his fluency. After a Score Analysis he took 6 weeks of TOEFL lessons with me. Then he did 4 more weeks of general conversation with one of my teachers. Finally, immediately before his TOEFL exam, he took another two hours with me to review strategies. 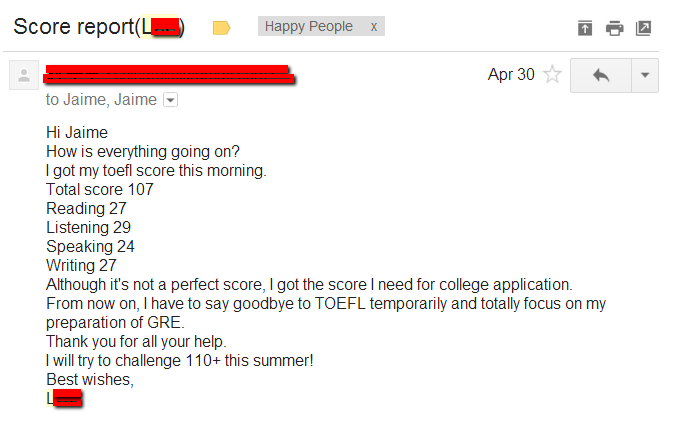 Like I said, he took about 18 hours of TOEFL lessons and 12 hours of conversation over the next few months. He reviewed vocabulary and wrote lots of essays. Basically, CL did all of the homework that we gave him 😉 And then… in April… he got awesome news! I’m a TOEFL taker from China. I took my first TOEFL test several months before. When sitting in a test center for the first time, I didn’t even know what was going to happen during the test. I got 95 on that test. After a month, I took it again. This time, I got an even lower score. Frustrated by the test, I turned to Jaime for help. By using the mock test, I finally realized the reason why I failed the test repeatedly and began to learn with Jaime in a totally different way. I am not a self-disciplined person. I owe my improvement to Jaime who always patiently corrected my essays and my pronunciation. Preparing for TOEFL is not a process of continuous advancement but a period of encountering plateaus and overcoming them. There are two key factors that I think are most crucial for TOEFL takers – knowing yourself and knowing your enemy, which are also the secrets of victory written in the ancient Chinese classic — The Art of War. After, I retook the test and got a 107. It is not a perfect score, but it is good start from where I can really begin to use English as a tool to explore the knowledge of the world. “Finish TOEFL, get on with your life”, as Jaime puts it. If we can take the test without being surprised, we are halfway towards the final victory.